Russ Greilich is a sound engineer who worked as a professional musician in the San Francisco Bay Area. He’s been with the Golden Era Musicians for 30 years. 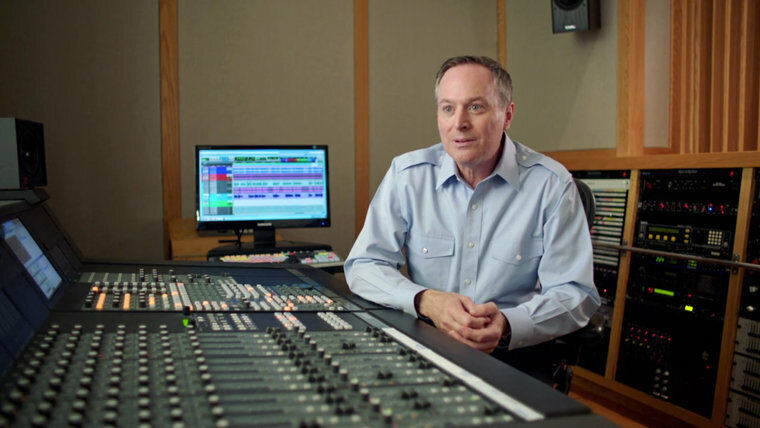 He also has worked with Mr. David Miscavige extensively as a mixer and sound engineer on the sound restoration of all of the Founder’s lectures on Dianetics and Scientology. I am a musician and an arranger and sound restoration engineer and I have also had the misfortune of having been Ron Miscavige’s boss during my tenure in the Church. I headed up the Audio Division of Golden Era Productions for a number of years and the band that Ron played in was in the Music Department in that division. Golden Era Productions is a branch of the Church of Scientology that produces audiovisual products for the Church. The band also did live performances and community events as well as international events and tours sponsored by the Church, and as a member of the band I also stood next to Ron in the brass section as a saxophone player for many years. He played third trumpet in that band. Ron also emceed for the band for awhile until his distasteful and crass remarks caused so much PR trouble for the band, the Church and the establishments where we performed, that Ron was banned from talking on the mic unless what he said had been scripted. Ron continued to act like he was conducting the band so as to make it look like he was doing something of import. As time went on, no one in the band paid attention to him. His “conducting” cues were often incorrect and we could not follow him besides the fact that they were, in the main, not needed. Due to his refusal to practice he couldn’t cut it on a lot of the parts and so he had made himself into a shill on stage. Really, he was just a crass carnie standing in front of the band often playing his trumpet out of tune. His channel on the mixboard would even get muted by the sound engineers so his playing would not degrade the horn section. But he was, out of respect for his son (the leader of the Church), tolerated. Truth be told, Ron Miscavige made his way within Golden Era Productions on the merits of his son and ran a con using the fact that he was the father of the leader of the Church to make his way around the studio. He was in the Music Department. His administrative skills were pretty much relegated to managing his Day-Timer and most of his “administrative concentration” was on his own special food shipments or exercise equipment. I have been there with Ron Miscavige and have personally seen him in operation. Having to deal with Ron in day-to-day affairs was miserable and consisted of lots of babysitting and dealing with his personal foibles. I would not want to wish this on anyone. Having to deal with Ron in day-to-day affairs was miserable and consisted of lots of babysitting and dealing with his personal foibles. Ron set himself up to live a life of leisure. He simply lived well at Golden Era—like all the staff at Golden Era do. I ate at the same table he did for years and dined on the same 5-star meals. I attended all the same “after gig parties” that were especially catered for the band. However, it never occurred to me that all the service I was receiving—my laundry being done for me, all my medical paid for and the beautiful studio environment and grounds—were anything but appreciated. Ron’s claims of discontent are personally insulting. Our studio facility and the service and support of the staff and executives are top-notch. Unfortunately, most of the work Ron profited from was done by others who were on the job while Ron was at home or exercising or sitting by those who were redoing and fixing his subpar melodies that were simply trite or unworkable. So, Ron says that he never wanted to really work at the studio and had plans to depart for five years. So why didn’t he? The answer is simple. He had his con game going on. Ron Miscavige was living for free. He had his own scoring room which he really never used as he refused to stay current and never developed the skills required for his job. Instead, he wrote outdated melodies that had to be redone or fixed by other composers and arrangers. Twenty feet away was a practice room that he never used, to the point that his trumpet playing became so poor, I and other arrangers for the band had to write simple parts for him or figure out what to do with him as he had become an appendage and antiquated. One hundred feet away was a full-blown state-of-the-art Music Recording Production facility that is beyond imagination and is touted with the utmost respect by any and all pros that I ever toured through it or who used it. Ron Miscavige, however, couldn’t set up his own mic or even use the studio gear, much less use his own music scoring equipment that was given to him. He literally told me to my face that he refused to learn the scoring software as using it and scoring with modern electronic and computer-generated sound is not real music—yet at the same time he could not orchestrate or score competently using traditional means either. I mean, as his boss I could not even get him to clean up after himself when he used the studio kitchenette. I mean, as his boss I could not even get him to clean up after himself when he used the studio kitchenette, let alone get him to learn the basic dispatch system used in the Church or to even follow the procedures within the Church to do a simple proposal for the purchase of his own work supplies. People “cleaned up after him” in all senses of that phrase. In short, over time Ron Miscavige became more and more useless, still living off the Church and producing absolutely nothing. In the scheme of things, he was a nut running around the grounds at the studio getting in people’s way, wasting their time with demands for attention and amusing himself with some senseless rude, crass or racial remark. These were at the expense of the actual productive people who were doing work and factually making the money that was paying for his very livelihood. For example, one of Ron’s favorite lines was to sing and chant “There is a n - - - - - in the alley with a hard-on, spread the lard on, rub it in.” He would sing this to the tune of the National Emblem march. He had another version of this that he did, which was “Oh, the monkey wrapped his tail around a flagpole, to see his a - - - - - -, and he did.” He would do this while stomping his feet in a 2-beat and clapping his hands—literally like a crazy person. He did this on numerous occasions in front of me, when a black friend of mine, Cliff Thomas, was about to go on stage to DJ dance music after one of our concerts. He also would refer to black performers we worked with as “n - - - - -.” To make matters worse, and add insult to injury, Cliff Thomas had a nickname that he went by, which was “Skeeter.” Ron called him “The geeter with the heater, it’s Skeeter!” Cliff hated this, so Ron of course took every opportunity to bring Cliff on stage with this stupid, insulting rhyme that played off his nickname. So, when I say he was running around the studio like a madman, I’m not joking. We tried to help Ron—he refused it—and of course behind our backs he really was intending to betray. We tried to help Ron—he refused it—and of course behind our backs he really was intending to betray. Not only was he just hanging out around the studio for free, all the while he was planning to take off without a word to us and scheming his next con—just another way to leech off the Church and his son. What sort of a human being would use betrayal as a means to survive? I say only the worst. Well, being a part of Ron’s life for many years, knowing what his lifestyle was really like, traveling many miles around the world with him, living next to him for many years, listening to him insult my wife (singer and the original Mary Magdalene from the Broadway show Jesus Christ Superstar) about her weight, and having to look after him like a babysitter, I would say that a fraudulent, fictitious, deluded fantasy would be a very, very polite description for the stories he is telling.